Synology have announced the new DiskStation DS1618+, a versatile, compact and powerful 6-Bay NAS equipped with a quad-core processor and designed for small and medium businesses. It comes with advanced computing applications to meet businesses demand and promises to "supercharges your storage" with an optional M.2 SSD adapter card for dual SSD cache drives. Synology say the DS1618+ is ideal to serve as a centralised file server for simplifying data management and protecting critical assets. 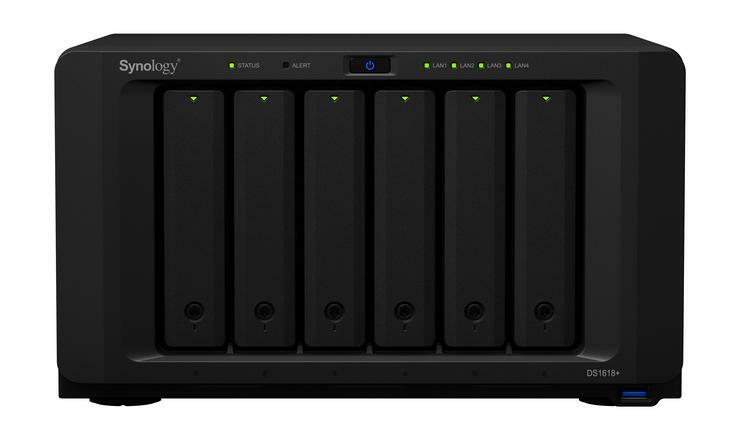 DS1618+ supports up to 16 drives with two Synology DX517 expansion units, allowing users to start small and easily scale up on demand. In addition to 10 GbE add-on card, which can upgrade the network capacity, the PCIe slot also supports the optional SATA M.2 SSD adapter card to function as SSD cache for greatly enhanced storage performance without using the 3.5inch drive bays. DS1618+ is equipped with a quad-core processor and 4GB DDR4 memory. With Link Aggregation enabled, DS1618+ delivers sequential throughput performance at over 1,550 MB/s reading and 580 MB/s writing. No local pricing has been announced yet but the device will launch on the 17th of May. For more information, visit www.synology.com.